Quality Cult Cinema has been approached by companies who would like to advertise here before, and I've always politely declined. However, when I was recently contacted by a new streaming service that specialize in showing independent movies that would otherwise be lost on the hard-drives of innumerable talented filmmakers from all over the world, I jumped to the occasion. 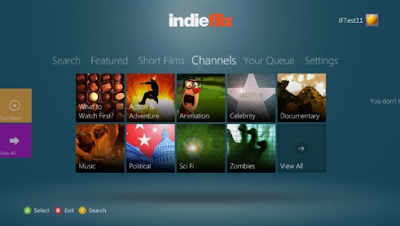 IndieFlix is a community of independent filmmakers and fans. It helps filmmakers translate artistic vision into commercial success, and gives film lovers access to high quality independent films not otherwise available. IndieFlix’s mission is to champion filmmakers, rethink traditional approaches to distribution, and celebrate the artistry and impact of independent film. Through it is a membership-based streaming service, they will not require anyone to enter their credit card number or otherwise obligate themselves to continue after their free trial period is up. Enables you to watch thousands of independently made films. Sort on many categories including genre, length, most-viewed, film festival, country or mood. Indieflix has a unique Royalty payment system called RPM Royalty Pool Minutes (TM) to share the money made through subscriptions with the filmmakers themselves. Every minute you watch could help fund the next Steven Spielberg. In other words: Just what the film industry needs! The people at IndieFlix have been nice enough to donate a bunch of two-month subscriptions to the readers of Quality Cult Cinema. To get your very own subscription, all you have to do is find a film here on Quality Cult Cinema that no one has commented on before, and make a comment telling me what you think about it. Also post your e-mail (or send a private e-mail to contact[at]cultcinema[dot]net telling me which movie you commented on) so that I can give you the subscription info privatly. That's it! The subscriptions will be limited to one subscription per reader, and handed out on a first come, first served basis. I'm obligated to say I'm also getting a free subscription for myself, as compensation for making this post, but to be honest, this is such a great service that I would gladly have advertised for free.